The prospect of using neural cell replacement for the treatment of severe enteric neuropathies has seen significant progress in the last decade. The ability to harvest and transplant enteric neural crest cells (ENCCs) that functionally integrate within recipient intestine has recently been confirmed by in vivo murine studies. Although similar cells can be harvested from human fetal and postnatal gut, no studies have as yet verified their functional viability upon in vivo transplantation. 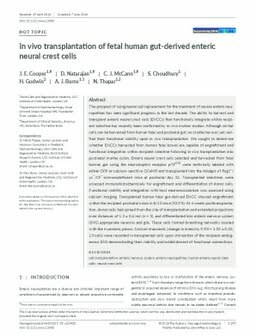 We sought to determine whether ENCCs harvested from human fetal bowel are capable of engraftment and functional integration within recipient intestine following in vivo transplantation into postnatal murine colon. Enteric neural crest cells selected and harvested from fetal human gut using the neurotrophin receptor p75NTR were lentivirally labeled with either GFP or calcium-sensitive GCaMP and transplanted into the hindgut of Rag2−/γc−/C5−-immunodeficient mice at postnatal day 21. Transplanted intestines were assessed immunohistochemically for engraftment and differentiation of donor cells. Functional viability and integration with host neuromusculature was assessed using calcium imaging. Transplanted human fetal gut-derived ENCC showed engraftment within the recipient postnatal colon in 8/15 mice (53.3%). At 4 weeks posttransplantation, donor cells had spread from the site of transplantation and extended projections over distances of 1.2 ± 0.6 mm (n = 5), and differentiated into enteric nervous system (ENS) appropriate neurons and glia. These cells formed branching networks located with the myenteric plexus. Calcium transients (change in intensity F/F0 = 1.25 ± 0.03; 15 cells) were recorded in transplanted cells upon stimulation of the recipient endogenous ENS demonstrating their viability and establishment of functional connections.